In this article I’ll demonstrate how to manage navigation links in the customer’s account dashboard: one way of removing new links from customer’s account dashboard which should be avoided and another way which is the way to go. One approach to delete desired links would be to comment out the action that displays the link. As an example I’ll take “Account Information” link in account dashboard which is located in app/design/frontend/base/default/layout/customer.xml (line 230). However, editing core files in Magento is never a good idea. Instead of this approach we’ll use something different. For start we’ll have to edit our config.xml file, we have to rewrite Magento’s core file. Now for every link we want to remove from navigation we need to add navigation link name and write the name of that link inside name tag. In your post I missed the way on adding the link ‘Delete My Account’. Your tutorial starts good when mentioning that it is never a good idea to edit Magento core files, but immediately after that it becomes very vague and sloppy! Can you please stick to a typical step-by-step tutorial explaining where to create what and how? Only the last step (Last thing we need to do is create layout xml file in app/design/frontend/default/default/layout/inchoo_core.xml:) was in detail. For start we’ll have to edit our config.xml file, we have to rewrite Magento’s core file. where? how? Next we have to define our layout xml file: where? Next step would be to create Block/Customer/Account/Navigation.php with following class: please specify a more detailed path? Can you help me how to add Log Out link at the end? I need to add one extra field say measurment in my left my account navigation and there will be fields to save customer details. Can anyone help me to make this happen? Any help will be appreciated. The linked code is incomplete and nowhere as detailed as this tutorial. 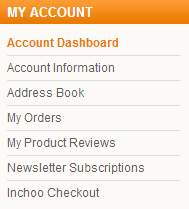 how to change the label name for example I need to change “Account Dashboard” to “Dashbord”. How it posiible..? Is there any chance to dispaly link based on customer group? Are you sure this is the right way to achieve this? I do not. Why we need to override/extend Magento’s blocks when we can use event-observer architecture to get the same result without touching any core class or conflicting with any third party module which also uses it (even it is bad)? This functionality was added to the core during the recent Hackathon in Zurich and will be available with next Magento release (which will most likely happen at Imagine). Even you can turn off the footer/top links easily from system configuration.